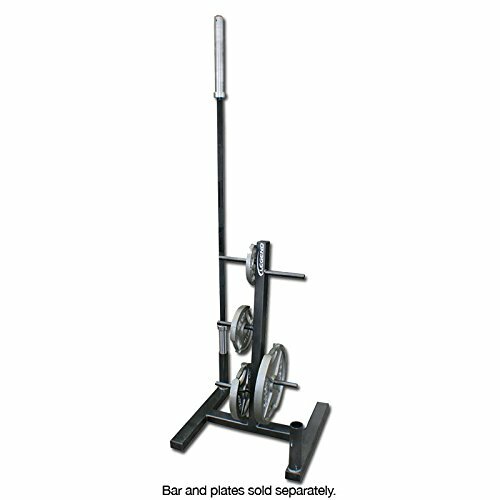 The Legend 3173 Combo Plate Tree and Olympic Bar Organizer is a great addition to any weight room allowing you to organize your plates and bars on one convenient rack. This heavy-duty vertical plate rack and bar storage rack is the perfect solution for smaller workout spaces where space efficiency is key and quality cannot be comprimised. Great for commercial gyms, schools, sports performance centers, military gyms, garage gyms, personal training studios, and home gyms. In addtition to holding all Olympic plates and most Standard weight plates, this all-in-one storage tree will hold two Olympic bars of any style inside upright steel tubing attached to each side of the frame base. Now you can conveniently store and access your Olympic power bar, Olympic weight lifting bar, Olympic curl bar, cambered Olympic bar, Olympic tricep bar, Olympic shrug and trap bar, or Olympic dumbbell handles from the same place you grab your plates. Small footprint, maximum storage potential! Since 1977, Legend Fitness has been committed to providing quality manufactured fitness equipment that is heavy-duty and proudly Made In The USA. Legend Fitness Equipment is made with big steel and perfect for schools, commercial gyms, military bases or anywhere that quality and safety cannot be compromised. Weight plates and bars are NOT Included (shown in image for demonstration purposes only). Weight plates and Olympic Bars NOT included. Five 8-inch solid steel pegs are 1-inch in diameter. Designed to hold Standard Plates (1" hole) or Olympic plates (2" hole) and two Olympic bars upright. Unit dimensions: 26" L x 26" W x 42" H. Unit Weight 75 lbs. Palletized Shipping Weight 125 lbs.